Arrangements for our early check in had been actioned so access to our room was very quick easy. Helpful receptionists. Lovely place but work on new casino starts at 6 and goes on till late you need to keep your doors shut and tv on. But everyone is helpful and your apartment is clean and replenishment of soap ect everyday. We had 8 nights and would go back again. We stayed in a two bedroom apartment. Beautiful view, lovely apartment. Bit noisy due to construction but minimal. Brisbane is one of Australia’s most vibrant cities—whether you’re coming for the outdoor adventures on the river, the scintillating nightlife, or the artsy subculture, it’s buzzing with energy and excitement. Brisbane holiday rentals offer the perfect chance to get to know the city, yet be able to escape to your own private enclave when you’re ready for a break. Why share your holiday space with tons of strangers when you don’t have to? Enjoy Australia in perfect luxury with your own private place to stay. holiday rentals in Brisbane let you unlock the magic of this thriving city, which is often referred to as Australia’s best-kept secret. Locals love to soak up the sunshine and enjoy the beautiful weather, and you’ll find it easy to swim, cycle, kayak, rock climb, or just stroll around the meandering city streets to your heart's content. If you want to beat the heat, you can check out the sandy beaches of Moreton Bay for a refreshing dip in the water. If you’re looking for some grown-up fun, check out the Granite Belt Wine Region, which is where a lot of Australia’s delicious wines hail from. And speaking of grown-up fun, the nightlife here is amazing, too. 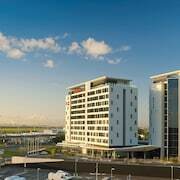 If you’re headed to "Brizzy" for a stay, make it a memorable one. 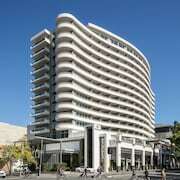 Short-term apartment rentals in Brisbane are a great way to see the city in style. Simply pick your dates, search Expedia to find the perfect property and price, and we’ll provide the details you need to make any special arrangements. Expedia ensures safe and secure booking so you can lock in your dream holiday property before you go. Don’t worry about lining up in a crowded hotel lobby for check-in—you’ll have your own place, complete with the comforts of home, so you can enjoy your subtropical retreat to the max.